Coca-Cola has partnered with Marvel to launch a Super Bowl commercial featuring two super heroes: The Incredible Hulk and Ant-Man. 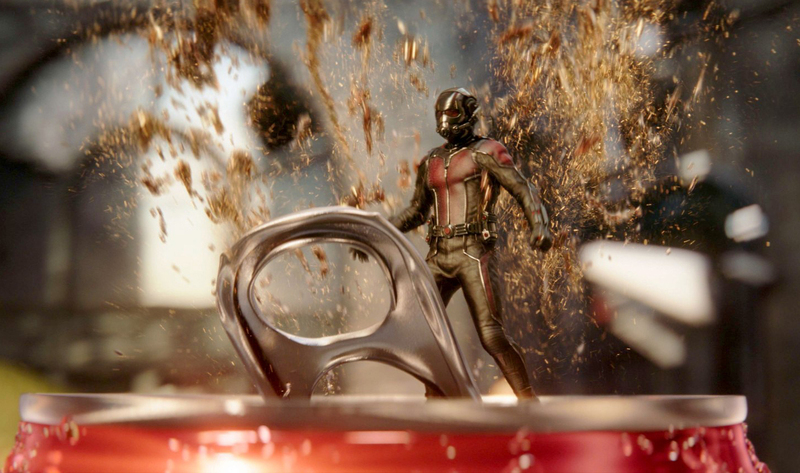 Ant-Man, voiced by actor Paul Rudd, is caught snatching the last Coca-Cola Mini Can from the fridge in Dr. Bruce Banner’s lab. An angry Dr. Banner turns into the Hulk and pursues Ant-Man throughout the city. Cornered in an alley after a high-energy chase, Ant-Man surrenders and helps Hulk, whose fingers are too big to open the Coca-Cola Mini Can. Both savor the prize. The final line: “Sometimes you just want a little Coca-Cola”. The ad features six “Easter Eggs” with details on the chance to score one of 30,000 Marvel-themed six-packs of Coca-Cola Mini Cans featuring Hulk, Ant-Man, Black Widow, Captain America, Iron Man and Falcon. The cans are not available for purchase in stores. Each day through Feb. 14, Coca-Cola will share hints on where to find the embedded clues on Facebook, Twitter, Instagram, YouTube and Snapchat. The virtual hunt will encourage fans to re-watch the ad online and discover the clues for the chance to get their hands on a limited-edition six-pack. The Coca Cola Hulk vs Ant-Man commercial was developed at Wieden+Kennedy, Portland, by executive creative directors Joe Staples and Mark Fitzloff, creative directors Hal Curtis, Antony Goldstein and Jeff Gillette, copywriter Becca Wadlinger, art directors Nick Stokes and Nate Nowinowski, head of TV production Ben Grylewicz and producer Robert Saxon, account management team Brian Mead, Thomas Harvey and Adelaide Smythe. Filming was shot by Russo Brothers (directors Anthony Russo and Joe Russo) via Bullitt with line producer Diane Catsup, executive producers Todd Makurath and Luke Ricci, and director of photography Trent Opaloch. Offline work was done at Final Cut, Los Angeles, by editor Crispin Strutters, assistant editor Zoe Schack, producer Michael Miller, head of production Suzy Ramirez, executive producer Eric McCasline. Colourist was Siggy Ferstl at Company 3. Visual effects were produced at Luma Pictures by VFX supervisor Vince Cirelli, Flame artist Claire Pereira de Souza, managing director Jay Lichtman, producers Louisa Cartwright, Michael Perdew and Matt Moran, creative director Matt Lydecker, animation director Raphael A. Pimentel, digital effects supervisor Justin Johnson, motion graphics artist Faraz Abbasi, supervisors Jared Simeth, Brendan Seals, Loïc Zimmerman, Alexandre Cancado, Andrew Zink, Oded Raz, Pavel Pranevsky, Thanapoom Siripopungul, technical coordinators Daniel Kepler, Andrew Kalicki, CG artists Dave White, Anthony Grant, Daniel Riddle, Dulshan Keragala, Joe Reif, Kyoungsoo Min, Lily Morgan, Mikey Rogers, Mohammad Modarres, Michael Hodgson, Tadao Masuyama, Tom Newbury, Sichen Zhang, Damir Filipovic, Lenny Gordon, Josue Arias, Kevin Bolivar, Marcos D. Romero, Marco Capparelli, Matthew Stoyakovich, Billy Dao, Justin Brunett, Meg Grube, Michael Vandenhoven, Monika Gelbmann, Ngan Chung, Tiffany Wang, Wen Zhao, John Cassella, Jacob Santamaria, Karl Rogovin, Daniel Bukevec, Imre Tüske, Jiyong Shin, John Kent, Johannes Gross, Lucas Pozzey, VFX producers Catherine Hughes, Justin Porter, Beth Senn, Cole Darby, Sheldon Neill, Timothy Bond, Celine Lam, Austin Baker, compositors James Waterson, David Larochelle, Michaela Danby, Chris Fung, Christopher Miller, Garrett Wycoff, Gregory Ng, Joe Censoplano, Joey Sila, Jun Eun Kim, Marc Schoenbeck, Matthias Dolphens, Michael Yates, Jonathan Harkes, Will Lovett, Cameron Sorgi, Andrew Alevizos, Christian Salvador, Marcel Martins, Matt Bacon, Meagan Green, and Shawn Sahara. Sound was mixed by Jeff Payne at Eleven Sound. Sound was designed at Skywalker Sound by Shannon Mills, with producers Eva Porter, Ashley Benton, Melissa Elston. Music was produced at Barking Owl by creative director Kelly Bayett and composer Christophe Beck.